@SenSanders those who got bonuses after that bailout should also get cuffs. WarOnDrugs? No, WarOnCorporations (and WarOnPACs)!!! OMG make it go back to the way it was!!! We'll pay your ransom! Catelyn RW: "PLEASE!" I can't READ this: there's all this blank space everywhere like Google! Why squish up all the text one side for the sake of emptiness? Is it a warning that TWOW is still blank?! And where's that usful sidebar on the right?! I can't find anything! Can I donate and get the old site back as a "theme"??? Still in awe. This could beat RW. This could beat film LOTR, any one of them. Hardhome was one of the best hours of TV I have seen. And possibly movies, too. And it didn't even have Stannis! Unbelievable! 20000/10. No wonder GRRM went home to get to work. If this was in his mind, and he saw it unfolding onscreen, ...damn he must be proud. I loved the way Sansa moved and spoke with conviction tonight, though we can surmise she's scared to death and hiding it well. She'll have Ramsay eating out of her palm in no time. Show_Ramsay clearly wants respect; that surprised me. He's twisted, but he minced no words in telling Myranda the simple truth (he's a Bolton now, off with you, I'm with Sansa). His psycho tendencies are still there, but Sansa could mold that. (She dealt with Joff and lived... that's saying something). Why Walda's announcement? To show that Sansa saw the "ah hell no!" look on Ramsay's face. Sansa's no Roose fan, and I think she can get through a wedding night and talk Ramsay into working against Roose and Roose's knights. Ramsay could grow to feel he needs Sansa for more than her name. She should remain scared of him, but I doubt she'll let him see it; she'd (ugh) "Littlefinger" him — use Ramsay to slaughter all her House's enemies, including, eventually, the Lannisters. Dany's being worked over by Missandei. No idea why unless Missandei is the Harpy on the show, but tonight Dany wondered how things had turned so bad, and Missandei said it was because Dany didn't listen to her advisors and that's why Dany's successful? And Dany bought that? Newsflash: Dany's a disaster, and Missandei is encouraging it. This is not book_Missandei. And that's why D&D showed too much Missandei and Grey Worm: not the romance, but Missandei's character. (Maybe she's not the Harpy, but something's going on with her.) I didn't love or hate the episode. I really liked parts, and I was really bored through other parts; the Wall was good (loved the short Stannis/Sam scene); Stannis was Stannis ("fewer"); the trip through Valyria was "interesting" (smoking sea? or foggy river!). Tyrion/Jorah walking to Meereen=lmao moment. 8/10, maybe 7/10 for the "too much WF" though I understand now what it was all building up to (the dinner party). If it had been paced better, a solid 8/10. This is really not doing it for me, this Brienne Warrior Princess BS. She's so damned different! I liked her before, but now I want her to just go away. She was more bearable in this episode, but really: so much screentime? Brienne? Don't tell me she's got a shot at the Throne or AA just because she's a girl with a lot of screentime for reasons I just can't discern. (Pod saved those scenes). But still, Kevan made this a 10/10 for me. 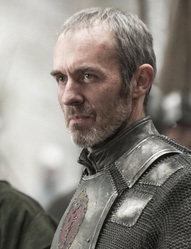 Stannis... everything at the Wall, just excellent. Lena H's acting is a reason to tune in, as is PD's and guy-who-plays-Varys. Sansa sends chills up my spine, which is strange because I'd thought/imagined Arya would "feel" like the "in a dark place" character, but it's Sansa. I should knock it down to 9/10 because too much Brienne, but I simply enjoyed the rest so much I couldn't bear to. Best show on TV; felt like it was over way too fast.